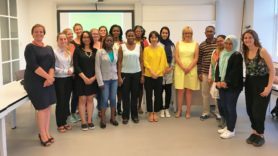 On the 22nd of June, Ceres welcomed academics, PhDs and master students for the Ceres Summer School 2017 at Utrecht University. In light of the global Sustainable Development Goals (SDGs) agenda, this year’s edition was themed “Engaging with the SDGs: Gaps, Opportunities and Challenges”. The day started with a keynote address by Prof Dr Henning Melber, Director emeritus and Senior Advisor of the Dag Hammarskjöld Foundation, in which he critically reflected on the role of the post-2015 development agenda on research in the field of development. Prof Melber specifically called upon the academics in the room to be wary of the steering power that the SDGs have had on the topics that are researched within the field. “The SDGs should not serve as a reference point to abandon engagement with other issues”. Moreover, Prof Melber emphasized the importance of keeping sight of the values that have guided the development of the SDGs and our own values as researchers. Because, quoting Stephen Browne, “attention to context and values may be precisely what is needed to lead humanity out of its current predicament”. It is possible to read the full text of the keynote address here. With the aim to cover as much as possible of the comprehensive agenda set for the SDG’s, the panel discussions were grouped into four themes: (1) Human Welfare and Development, (2) Economic Growth and Development, (3) Environmental and Climate Management and (4) Governance, Social Justice and Cooperation. In total, there were 12 panel discussions with 45 presentations of young academics covering the vast majority of the SDGs. Presentations varied from the importance of creative public spaces in Sao Paulo to foster inclusion (Goal N.11), to participatory processes involved in the formulation of the targets and indicators of Goals n.12 and the influence of changing gender structures on early marriage in Senegal (Goals 3 and 5). 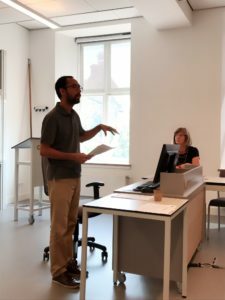 In addition, papers were presented on what is currently missing in the SDG agenda such as the incorporation of local knowledge and services provided by informal actors. To see the full range of papers discussed, read the abstracts submitted for presentation here. During the closing plenary session, Prof Thea Hilhorst of the International Institute for Social Studies (ISS) presented on security guidelines for field research in hazardous places. As field research in remote and potentially dangerous places always carries a risk, Prof Hilhorst emphasised the importance of training and preparation before going to the field. Her recently published guide can be downloaded here. Looking back at a successful event, we hope it has been a stimulating and thought-provoking day for all the presenters and the participants. Even more, we hope it increased the engagement with your field and your peers.